The 2019 Dartmoor frames have arrived! Now you can build your dream bike again from a Hornet, Primal or Two6Player frame. Whether 29 "-Trailhardtail or playful 26" -Dirtjumper - here you will find the right frame! You would prefer to assemble your bike yourself with the components that you wish to have? Then, you should find something here in our category Bike frames. 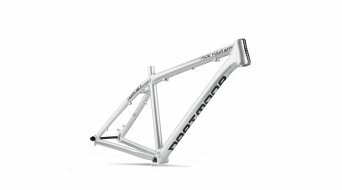 Road bike frames, MTB frames in numerous variants, cross bike frames, fat bike frames and more! A frame or even a frame kit will give you free reign in terms of the structure of your dream bike. The frame signifies the foundation stone and is the basic element of your bike. Of course, not all components are combinable with all frames, therefore you should not do it alone without the required technical knowledge. But the joy and passion which you can expend on such a bike structure should not be underestimated. If you have not bought your bike "off the shelf" but have completely built it with your own inspiration and maybe even with your own hands, you will enjoy the riding experience even more if it is ready at last and the first test round is in the offing. Real bike enthusiasts properly celebrate the build of the bike almost as the riding of it. After all, it is supposed to become something special, your built-up bike. Discover the different frame variants, which we offer here online. All the top brands are awaiting you! Frames in different price ranges so that there are frames affordable for everyone. Whether a hip 27.5 hardtail frame, a road bike frame for fast road sprints or your new downhill frame with proper suspension in the rear, all frame sizes and designs are being represented! For different application purposes, for the road or offroad. Titan or carbon frames for your new light-weight project? Or a classic aluminium frame? Whatever you choose. We wish you a lot of fun building your bicycle, you'll find the fitting frame here in our shop for bike frames.